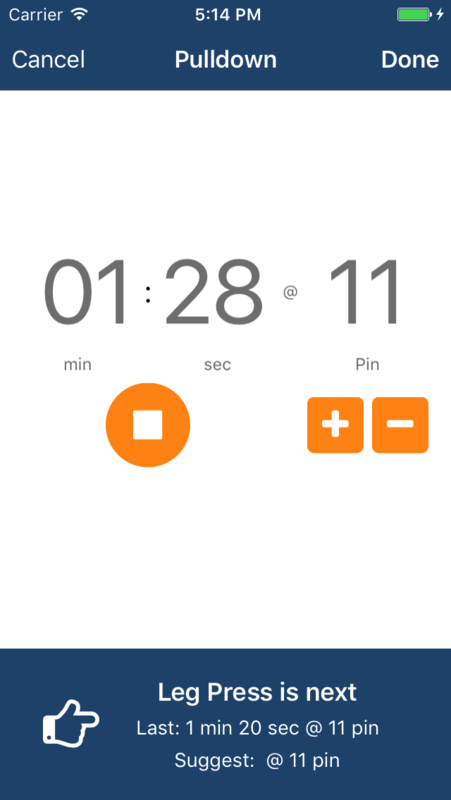 TUL is a simple exercise app for tracking your Time Under Load. TUL is designed to be your perfect high intensity training partner. Plot your Time Under Load for each exercise to track your improvements over time. TUL is designed for single set to failure workouts. No tracking of sets or reps. Just Time Under Load. TUL is the simplest exercise app on the market. Ready to start right out of the box. Configure your own Time Under Load target range. Add your own exercises. How should I use the app? TUL is designed to track high intensity training (HIT) workouts following a single set to failure routine. That means, performing one set of each exercise until failure and tracking the Time Under Load for each set. Where can I learn more about high intensity training? TUL was inspired by the workout routines described in the book Body By Science by Dr. Doug McGuff although there are many other places where you can read more about it. What is Time Under Load? Time Under Load is the time that your muscle is actively working against a load. In the case of exercise, this would be the time you are moving a weight. When using the app, start recording your time when you first start the exercise and stop the timer when you finish the exercise. This is your total Time Under Load for the exercise. Why is there no place to record how many sets and reps I've done? TUL is specifically designed not to record sets or reps. It assumes you are doing single sets of each exericse. It is designed only to track Time Under Load for each exerise. If you are interested in counting reps or sets, this app is likely not for you. Can I track weight instead of pin for my exercise? At this time, the app assumes you are using machines for your exercises and that each machine has a discrete setting ('pin'). There is nothing magical about this number however and if you use free weights, you could, for example, assign a 'pin' value to mean 5lbs increments. But there is no way to mix the concepts of 'pin' and 'lbs' at this time. What do the arrows mean next to each exercise? 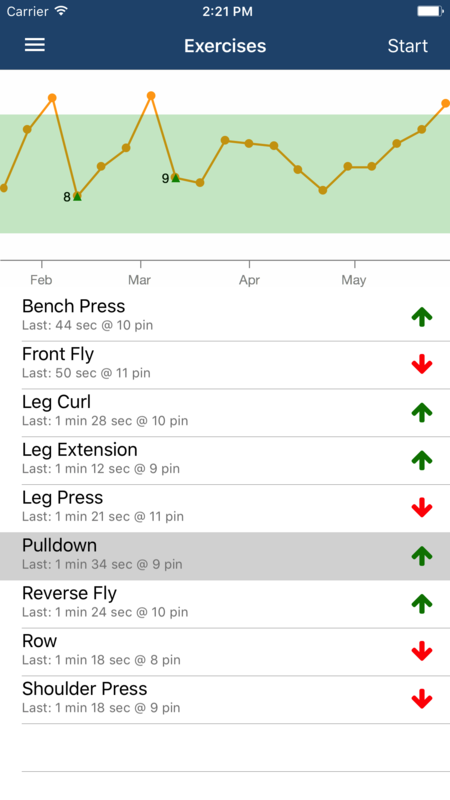 After you have done more than two sets of an exercise, the app will show either an up or down arrow to indicate performance of the last set relative to the previous set. The comparison is done by multiplying the Time Under Load by the pin setting. What do the arrows mean on the graph? The arrows on the graph indicate when the pin value was incremented/decremented relative to the previous set. The numeric value next to the arrow indicates the new pin value. What should I target for my Time Under Load? Good question. Difficult to answer. There is likely not one universal optimal target for Time Under Load. The app sets a default target value of between 45 to 90 seconds. But experience and exploring how your body responds to different ranges will be more useful than trying to find a universal Time Under Load target range. © 2017 Always Twirling Ing. All Rights Reserved.